Simple stresses are produced by constant conditions of loading on elements that can be represented as beams, rods, or bars. 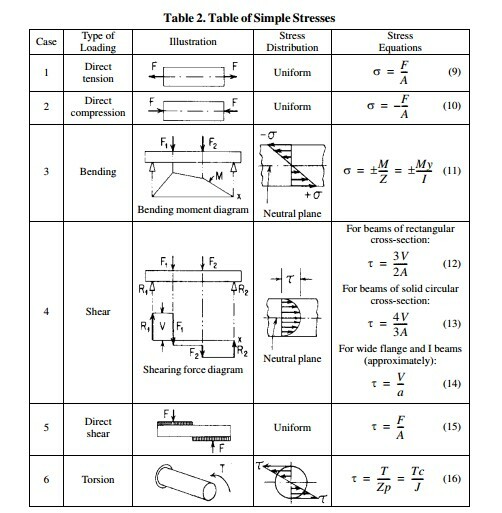 The table summarizes information pertaining to the calculation of simple stresses. Following is an explanation of the symbols used in simple stress formulae: σ = simple normal (tensile or compressive) stress in pounds per square inch; τ = simple shear stress in pounds per square inch; F = external force in pounds; V = shearing force in pounds; M = bending moment in inch-pounds; T = torsional moment in inch-pounds; A = cross-sectional area in square inches; Z = section modulus in inches; Zp = polar section modulus in inches; I = moment of inertia in inches; J = polar moment of inertia in inches; a = area of the web of wide flange and I beams in square inches; y = perpendicular distance from axis through center of gravity of cross-sectional area to stressed fiber in inches; c = radial distance from center of gravity to stressed fiber in inches.